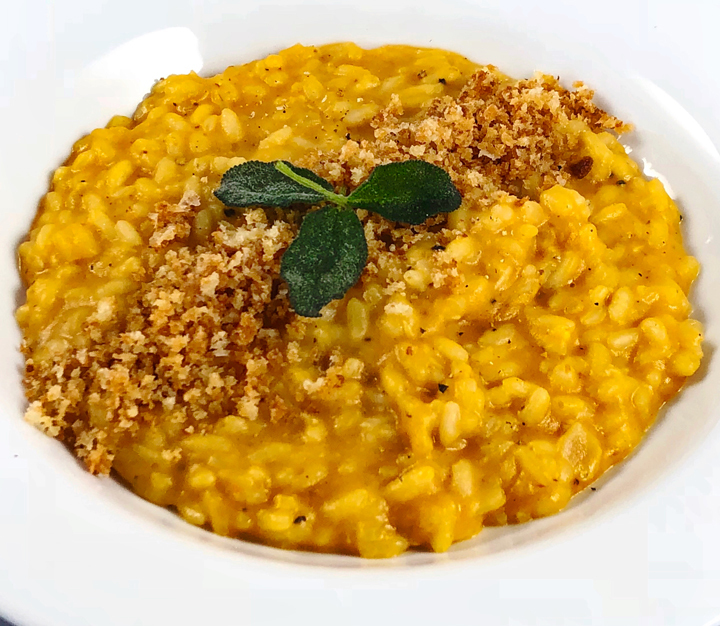 To create a deliciously creamy and luscious fall risotto, we finish the dish with pumpkin, butter, and parmesan cheese. Then we topped it with contrasting crunchy parmesan crumbs and fried baby sage leaves. In a large sauté pan over medium heat, melt the butter. Add the bread crumbs, toss, and cook until the crumbs are toasted. Add the parmesan, remove from the heat and set aside. Wash and dry the sage leaves thoroughly. In a sauté pan, add 1/4” olive oil, and heat until simmering. Add the sage leaves and cook for about 1-2 minutes until just starting to turn brown. Remove and set on paper towels until ready to serve. Place the stock in a large saucepan, heat the stock to a simmer, and continue lightly simmering while you make the risotto. In another large saucepan over medium heat, add oil onion and garlic. Cook until onion begins to soften, about 3-5 minutes. Stir in rice and sauté for about a minute longer. Add wine, and cook until wine has evaporated. Add 2 cups of the stock to the rice and stir until almost absorbed. Repeat with another cup of stock, and continue stirring and adding stock until the rice is almost tender but still has some bite to it, about 20 minutes. When you have reached this stage, add the pumpkin and stir until the pumpkin is absorbed and the liquid has evaporated slightly. Stir in the cheese, butter, nutmeg, and add the salt and pepper to taste. Add the risotto to six bowls and top with the Parmesan crumbs and fried sage.